I’ve been playing with teaching myself crochet over the past year or more, learning various stitches and such. This is the first piece fit for public consumption, mostly completed over a year ago. Completed except for knowing what to do with the ends, of course! YouTube to the rescue… there are a number of excellent how-to videos for crochet in all shape and form and process, so it was easy to dig one up, buy some yarn needles, and dig in. I am very proud of my potholder/dishrag/Barbie blanket LOL! Mr. Bun also approves, apparently. If not, he was kind enough to say nothing about it. LOL! You’d think crocheting would be easy for us, no?! Can’t wait to see the scarves. Aw, DeeDee, thank you! I have GOT to get over to your blogs more often!! Some fibres are so much easier to work with than others! But I bet your scarves will turn out beautifully. 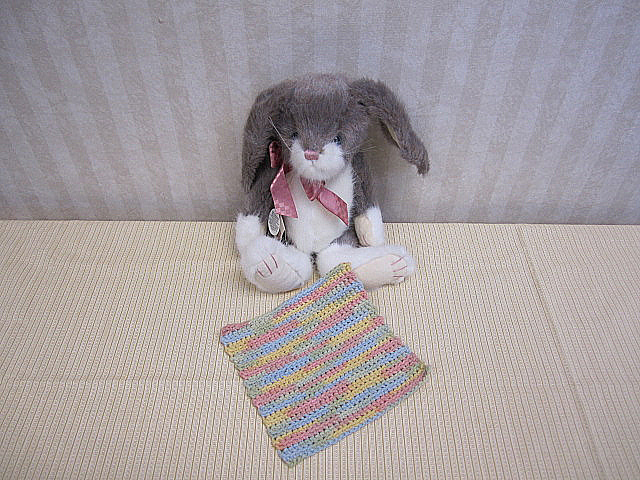 Mr. Bun looks adorable with your crochet piece! Did you ever crochet scarves?